The documentation for this interactive installation work shows a fascinating piece that responds to the speaker’s movements, stillness, and silhouette to give shape to the poem. 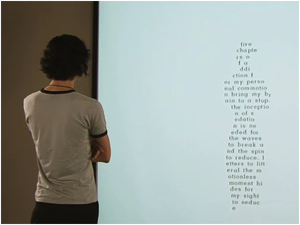 As seen in the video and discussed in the artists’ paper, “Inter-Inactivity,” this piece rewards stillness and holding a pose for the text to shape itself based on the reader’s body. The linguistic text of the poem within is constant— what changes is the shape given to it with our bodies, which is an interesting twist on the age old question of whether form shapes content or content shapes form. In this case, the added variable is that the reader shapes the form, which would seem like it’s an authorial release of control but isn’t because the text is behaving exactly as programmed. Read the poem and you’ll find that it was written to address this very question of shape and fluidity.